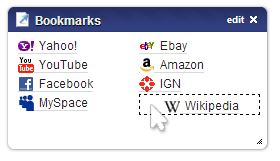 By popular demand, we’ve made it easier to manage your bookmarks. You can now drag bookmarks between widgets, or even drag them within a widget to reorder them. To drag a bookmark, ensure that you drag it by the bookmark icon. As before, you can still click the ‘edit’ button on a bookmarks widget to edit your bookmarks in list mode. This entry was posted on Friday, February 15th, 2013 at 1:40 pm	and is filed under new features. You can follow any responses to this entry through the RSS 2.0 feed. Both comments and pings are currently closed. You added favicons to the bookmarks widgets and now I have to rearrange everything because the sizing is all wonky. Grr, there should be settings to turn that off. Thanks, though for trying to keep adding new and improved stuff to Protopage. I’ve been a user for many, many years and continue to recommend you. Hi Cheryl, this issue has now been resolved. Favicons should no longer appear on your page. Is this for a specific browser, or should it work in any browser? Ah, it works, sorry I did a restart on Firefox. Any chance of being able to do the same trick with RSS feeds? As you know I’m a huge user of these and the ability to be able to move them around would be brilliant I know I can do it via edit, but being able to do it with the actual site name would be excellent. Hi Steve, drag and drop is quite a tricky thing to implement with RSS feeds because of the complex nature of RSS feed items when compared to bookmarks. We’ll make a note of it for the future though. I would like to be able to copy a bookmark or To do List to other tabs. Is that possible? I would like to see an ability to categorize bookmarks. I have hundreds of well organized bookmarks. However, the bookmark widget I see in Protopage will not be very effective for me without the ability to categorize. Love this feature. But, need some advice on how to export/backup my book marks. I have put a lot of work organizing my bookmarks and want to make sure I can back it up. Any advice?